Tax fraud is a hot topic in the news and for good reason—tax scams and tax identity theft continue to rise. 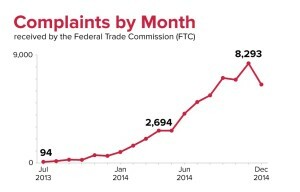 The Federal Trade Commission just released a report revealing some eye-popping numbers. In 2014, there were 24 times more (!!!) complaints than the year before from consumers saying criminals were impersonating IRS officials. And, tax-related identity theft topped the list of complaints in 2014 for the fifth year running. To avoid becoming a victim, be aware of common scams and follow some simple best practices from the experts. The fraudsters, pretending to be from the IRS, call and say you owe the IRS money. You’re told if you don’t pay, you could be arrested or face legal action. To avoid this, you must pay immediately by wiring money or by loading a pre-paid debit card. Scammers will sometimes also leave an “urgent” voicemail callback message if no one answers the phone, or try to reach you over email. Arm yourself with knowledge. The IRS will never call, text you, or email you about unpaid taxes or penalties, the FTC says. Instead, the agency typically contacts customers using snail mail. If you do receive a call, hang up and report the scam. You can contact the FTC and the Treasury Inspector General for Tax Administration at gov (there is a yellow box at the top of the page). In this scam, your tax refund is hijacked by a criminal who uses your identity to file a fraudulent tax return to get your refund before you can. Victims don’t know it has happened until they file their own taxes. Watch for warning signs. 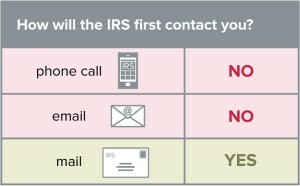 The IRS warns that if official records show you received wages or income from an employer you did not work for, if you owe additional taxes for a year you didn’t file a tax return, or if more than one tax return was filed using your social security number, these could be signs of tax-related identity theft. Contact the IRS immediately. File early. The FTC says, “Consumers’ best defense is to file their taxes as early as possible to get ahead of scammers.” You could file your taxes beginning January 19, so go ahead and submit them ASAP. If you think you’re a victim, report it immediately. 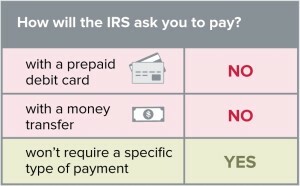 The IRS has an online guide to help you through the process. Protect Your SSN– Thieves use your Social Security number to file taxes and claim your refund. Without it, they cannot commit tax identity theft. Do all you can to protect your SSN and don’t give it out unless absolutely necessary. Check your credit often to notice early signs of id theft. Submit Your Taxes Securely– When you do file your taxes, do so securely. If you file online, use a secure connection and a computer with updated antivirus software, a firewall, etc. If you’re mailing in your return, take it to the post office directly. Don’t leave it in your mailbox or in an outdoor mail collection bin.